“Wine is sunlight held together by water.” – Galileo Some of my happiest moments have happened when wine was being served. My family aren’t wine snobs, but we do enjoy our California vintages. So when I was offered the chance to attend a wine seminar for bloggers, of course I jumped at the opportunity. As you all know, I have a love affair with California. My roots are very deep here. The drive up to Amador County from Sacramento is not just scenic. It’s spiritual. A sense of calmness and peace flows over me as I watch the flat Central Valley slowly become the rolling beginnings of the foothills, dotted with oak trees. Up a little winding country road, we find Story Winery. Do you see that view? If that doesn’t calm your soul, nothing will. Safe from the heat of the day, tucked away where wine was stored, we were treated to knowledge about all things wine. I’ve been going wine tasting for at least 7 years now and honestly, I didn’t know that much about it. What I do know and what Cinde Dolphin, Director of Marketing for Story Winery, told us is that you shouldn’t allow others to make your wine decisions for you. Your palate is unique. If you like the cheap stuff or if you like the $100 bottle of wine, it doesn’t matter. 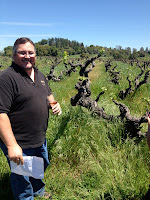 Brian Reid the assistant wine maker gave us a bit of a history lesson when we walked out into the vineyard. Some of their vines are 100 years old and are called Mission vines. As you may know a few of my ancestors helped to found a few of those missions in California, so I’m pretty sure wine drinking is in my DNA. Also we were told about a naked chardonnay. Get your mind out of the gutter. Apparently it means it’s not oak laden as the wines from the 80s were. Apparently back in the 60s and 70s naked chardonnay was all the rage. After the history lesson and a bit of a chemistry lesson, we moved on the best part…the three S’s. What are the three S’s? Sight, sniff and sip. There’s something relaxing about swirling a glass of wine around in your hand. And then the aroma or bouquet if you want to be all wine fancy, just sings to your sense of smell. Of course, the sip is the best part. The good people of Story Winery taught me to ignore the first sip. It’s too much of a shock to your tongue. The second sip is when you will get the true taste of a glass of wine. But wine isn’t just about drinking. It’s an event. You can sit under the lovely trees, gaze at the vistas before you and chat with friends. Don’t be intimidated by wine tasting. Everyone at Story was very friendly. Most people are happy and want to teach you about wine if you are a newbie. 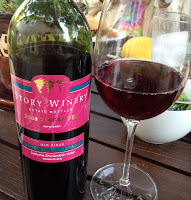 So, if you are looking for an exciting new adventure not far from downtown Sacramento, I suggest heading up to Story Winery in Amador County. Remember, you don’t have to swallow. It’s OK to spit. They have a bucket right there for you. Of course, there’s a trick to that if you don’t want wine dribbling down your chin. Use a bit of force like a cowboy spitting tobacco in a western.